Motor coaches and retired UTA vehicles do not comply with state rules for student transportation. (Rick Egan | Tribune file photo) A school bus from Monument Valley High School passes Jaydon Yazzie, VanteJren Atene and McKalette Clark, as they ride home from school on their horses onThursday, January 30, 2014. A passenger vehicle could be a well-oiled machine in optimal working condition. But unless it checks a series of boxes outlined in state rules, that vehicle can’t be used as a school bus. It’s a scenario faced by a handful of Utah private and charter schools, according to Utah Highway Patrol Lt. Greg Willmore, as would-be buses purchased or received as gifts fall short of safety standards. Willmore’s comments came during last month’s meeting of the Utah Board of Education’s finance committee. Along with UHP Sgt. Jason Kelsey, Willmore said collaboration and communication are needed to ensure that appropriate vehicles are obtained by schools and used for student transportation. 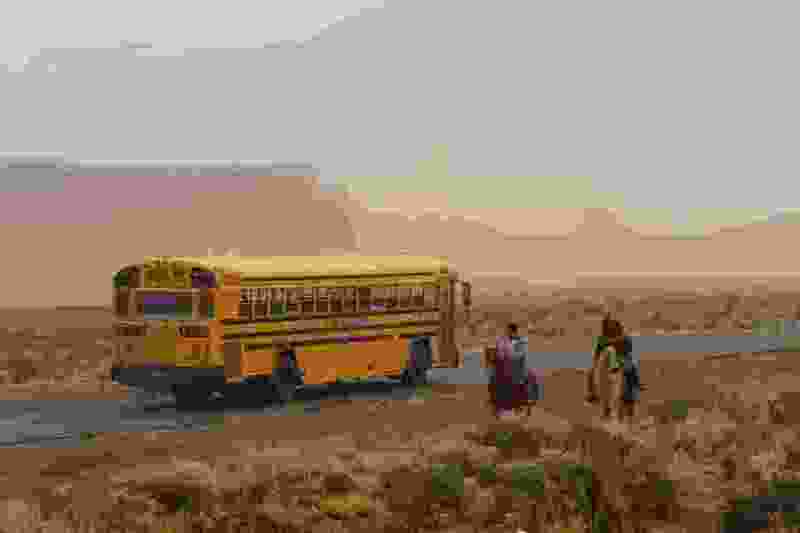 Willmore and Kelsey shared anecdotes of schools investing more than $100,000 on motor coaches or buying used school buses at a discount from out-of-state sellers that don’t comply with current Utah rules. In one case, they said, a Utah charter school had been gifted two retired Utah Transit Authority vehicles that, while a boon to the school’s budget, can’t legally be used to move students. Charter schools are public schools, but they are excused from the state mandate — and state subsidies — to provide pupil transportation to and from campus each day. As a result, most charter schools don’t operate a fleet of buses, like districts do. Increasingly, Utah charter schools are looking at transportation options to boost or better serve their enrollments and to help students participate in extracurricular activities like athletics. Activity buses are granted some flexibility from school transportation rules, Willmore said in an interview, meaning they can be a different color than the traditional yellow and can forgo some of the required exterior lights of a traditional school bus. But the interiors must be largely the same as a traditional bus, Willmore said, including the large, fully padded seating and storage compartments to keep loose items from becoming projectiles in a collision. “Beside the color and the lights, they need to meet all the other standards,” Willmore said. An old UTA vehicle may be ideal for moving a group of people from one side of town to another, Willmore said, but not necessarily for carrying the varsity football team and their gear to the state championship game. During the committee meeting, staff members suggested that transportation rules could be disseminated to schools in the short-term while school, government and transportation officials collaborate on how best to move forward. School board member Kathleen Riebe said buses should decommissioned if they don’t comply with the rules, independent of the cost to individual schools. Her board colleague Joel Wright questioned whether the requirements were unnecessarily strict and whether the Utah Board of Education is the appropriate body to determine vehicle safety. “What’s safe for UTA is apparently not safe for kids,” Wright said. Van Tassell said charter schools are cautious about student safety and willing to ensure transportation standards are met. Charters often don’t have the staffing of a school district, he said, and the lapses in bus requirements are the inevitable result of the complex and voluminous rules for public education. “Somebody may not recognize where all of the i’s need to be dotted and all of the t’s need to be crossed,” he said. Charter schools currently account for more than 11 percent of the state’s total public education enrollment. As charters grow in popularity, Van Tassell said, more administrators are looking at busing to alleviate traffic congestion and enhance a child’s educational experience.